Listed on some old maps as the “House of Knowledge,” the Painter Library stands today as one of the most intriguing and unique structures at Tyler. The brothers constructed their hall utilizing the most advanced fireproofing technologies of the day, including a tin roof and fireproof paint. Two vaults, built directly on top of one another on the western end of the building, are completely masonry, with doors and window shutters of metal. It is within these vaults that the Painter Brothers housed their most precious and valued documents, including their family papers and history. 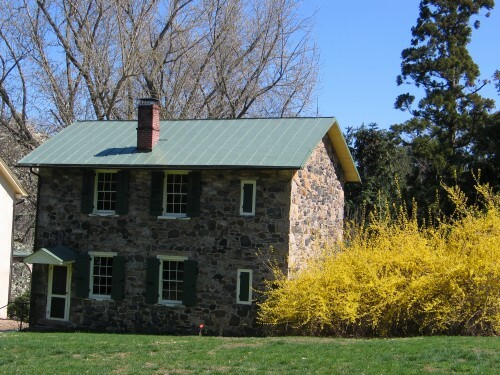 Jacob and Minshall spent much of their final years in this special building, conducting scientific experiments, maintaining their meticulous farm and homestead records, and studying their specimen collections. Avid readers and writers, their library collection exceeded 1,000 books, predominately works of nonfiction. A hand printing press was added to the library, on which the brothers printed pages on their ancestral history, and various pamphlets including thoughts on a phonetic alphabet, and a numerical system based on sixteen. A few museum pieces which stand out among the Painter’s treasures include a refracting telescope for the observation of the stars and heavens, a beautiful box camera on a tripod, and various devices for recording and measuring meteorological data. There’s even a plaster head for the study of phrenology! The remains of a hot-water boiler, which the brothers used for bathing purposes, can be found in the cellar near the chimney. There are rumors this crude amenity was added at the request of Mary Ann Regester, a housekeeper the bachelor brothers hired on in 1847, when, after their sisters had all married and moved on, they found themselves without a female residing in Lachford Hall. Perhaps Miss Regester grew weary of the boys coming in from the fields and soiling her kitchen and wash basins, and gently suggested this “modern day” convenience. From April through October, the Painter Library is open to the public for guided tours on the first Sunday of the month, which are free with admission. Friendly and knowledgeable docents will share their passion and offer glimpses into the fascinating minds and the daily lives of the Painter Brothers.